What is a Dialysis Machine? 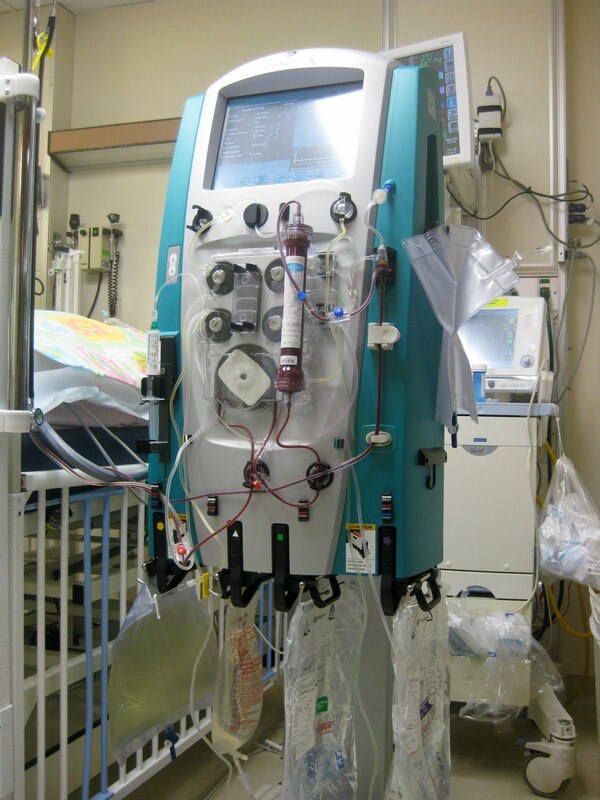 A Dialysis machine(also known as ‘kidney machines’) are machines that replace renal(kidney) function whilst a Patient is in Acute Kidney(Renal) Failure or it can also be used for chronic renal failure. If the kidneys are not working properly, the result is usually fluid overload, an accumulation of excess electrolytes such as Potassium, Magnesium and Calcium and it results in an accumulation of Urea and Creatinine(increased kidney markers in the blood and a sign the kidneys are not working), which can lead to haemodynamic and metabolic(chemical) disturbances if not treated. The Dialysis Machine processes the removal of waste and the removal of excess water from the blood, and is used primarily to provide an artificial replacement for lost kidney function in people with renal failure. Dialysis may be used for those with an acute disturbance in kidney function (acute kidney injury, previously acute renal failure), or progressive but chronically worsening kidney function–a state known as chronic kidney disease. The latter form may develop over months or years, but in contrast to acute kidney injury is not usually reversible, and dialysis is regarded as a “holding measure” until a renal transplant can be performed, or sometimes as the only supportive measure in those for whom a transplant would be inappropriate. The kidneys have important roles in maintaining health. When healthy, the kidneys maintain the body’s internal equilibrium of water and minerals (sodium, potassium, chloride, calcium, phosphorus, magnesium, sulfate). The acidic metabolism end-products that the body cannot get rid of via respiration are also excreted through the kidneys. The kidneys also function as a part of the endocrine system, producing erythropoietin and calcitriol. Erythropoietin is involved in the production of red blood cells and calcitriol plays a role in bone formation.Dialysis is an imperfect treatment to replace kidney function because it does not correct the compromised endocrine functions of the kidney. Dialysis treatments replace some of these functions through diffusion (waste removal) and ultrafiltration (fluid removal). Blood is removed via the catheter and is circulated through a filter in the machine to clean the blood and is then returned via the same line. Dialysis works on the principles of the diffusion of solutes and ultrafiltration of fluid across a filter(semi-permeable membrane). Diffusion is a property of substances in water; substances in water tend to move from an area of high concentration to an area of low concentration. Blood flows by one side of a semi-permeable membrane, and a dialysate, or special dialysis fluid, flows by the opposite side. A filter(semipermeable membrane) is a thin layer of material that contains holes of various sizes, or pores. Smaller solutes and fluid pass through the membrane, but the membrane blocks the passage of larger substances (for example, red blood cells, large proteins). This replicates the filtering process that takes place in the kidneys, when the blood enters the kidneys and the larger substances are separated from the smaller ones. The Dialysis Machine removes waste and excess water from the blood in different ways. Haemodialysis removes wastes and water by circulating blood outside the body through an external filter, that contains a semipermeable membrane. The blood flows in one direction and the dialysate flows in the opposite. The counter-current flow of the blood and dialysate maximizes the concentration gradient of solutes between the blood and dialysate, which helps to remove more urea and creatinine from the blood. The concentrations of solutes (for example potassium, phosphorus, and urea) are undesirably high in the blood, but low or absent in the dialysis solution, and constant replacement of the dialysate ensures that the concentration of undesired solutes is kept low on this side of the membrane. How long is Dialyisis required for? Your loved ones condition will determine how much dialysis is needed. In Intensive Care this can range from a couple of days to many days and sometimes weeks.